I've been meaning to consult a doctor for a while now about my digestion problems but I've been too scared. A friend's story about her brother's painful stomach and with the encouragement of my twitter friends, finally I decided that I really need to consult a doctor. I don't want to consult from a doctor in our area, so I thought it is best to go to Medical City where they have specialist on gatroenterology. I don't know any doctor from there so, I searched for their website and just look for a lady doctor that is an internist and gastroenterologist. I found one and I went today with my SIL at the hospital. It's my 1st time to enter Medical City and I was amazed how big and clean it was. 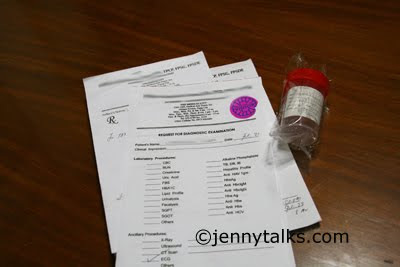 I was so very nervous because for the 1st time I'll be consulting a doctor about my stomach problems. I told my doctor about my problem and she advised me undergo some tests that can really pinpoint what's wrong with my stomach. 5. ECG - which I have already been tested today. It was already past 12 when I'm finished and since the hospital is just near Robinson's Galleria, so we decided to eat our lunch there and do some shopping hehe. Hi Rosie.. tell your mom not to be afraid . she will not feel it because she will be sedated.. The package i got from Medical city: endoscopy, colonoscopy with sedation P12,850k, plus prof. fee of my endoscopist is (11k) 2 procedures kasi ginawa nya at anesthesiologist (5k) so mga less than 30k.